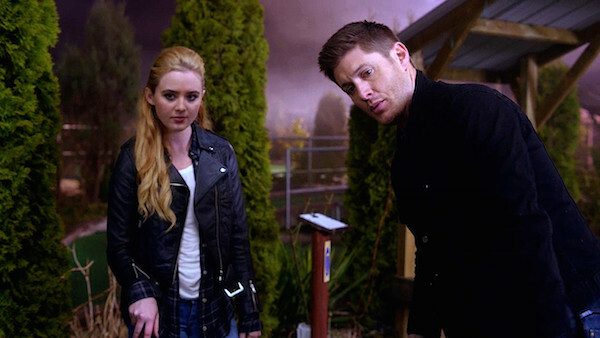 This week’s episode of Supernatural, penned by Robbie Thompson, saw the return of Claire Novak, played by the always excellent Kathryn Newton. When we last saw Claire she was heading out on her own, with her mother having been missing for a long time and just finding out that her father Jimmy was dead. Angel Heart opens with Jimmy walking through the door of his house to meet an overwhelmed Amelia (played this time around by Leisha Hailey) He tells her that Castiel is gone and for a minute she (and we) believe it until blood starts appearing on her arms. Amelia suddenly wakes up in a barn, strapped to a bed with a strange man leaning over her. As he cuts her and appears to eat the essence escaping from the cut, she fades back into the hallucination of Jimmy coming home. Claire seems to be doing well traveling on her own, tracking down people who might be able to help her with finding her mother, although she isn’t having a lot of luck in actually getting any information from the person she meets at the bar. When he appears to have more information than he is letting on, she tries to stop him and ends up in the hospital after being knocked out, where the staff calls Cas when they find his number in her contacts. 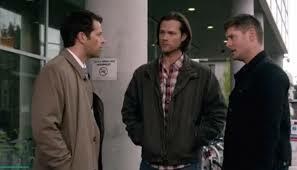 Cas calls Sam and Dean for back up, which I found very amusing. He didn’t call them because they are friends and he wanted support, but because they had been troubled teens themselves and could relate to Claire! Both Sam and Dean are amused at this but agree to go in, despite Dean’s misgivings about how Claire will react to him being there. As expected, Claire isn’t very happy to see any of them, but when Sam tells her that they aren’t leaving until she tells them what happened, she confesses that she was looking for her mom. Not to try to get her family back together, but to tell her that she ruined her life. After hearing her story, Cas wants to help find Amelia and Dean agrees, saying that it could be hunt related. When Sam is a little reluctant, Dean’s comment of, “come on, give me something to punch already” gives both Sam and Cas pause before Dean realizes what he said and makes light of it, saying he’s fine. Claire however, has decided to leave without them, leading to them splitting up; Sam to go and find Claire and Dean and Cas to go look for the guy at the bar who may have information. On their way to the bar, Dean tells Cas that maybe he should let Claire go out on her own, talking about how she would be stronger with nothing to hold her back. After his comments last week about the brothers being stronger together, I think that Dean still believes that, but his concern over what the Mark is doing to him is causing him to rethink whether people should be around him. When they reach the bar and find Ronnie, Dean gets a little enthusiastic with his questioning, slamming him into the table repeatedly until he tells them about Holloway, the faith healer he works for, recruiting people for him that nobody would miss. Ronnie says that he hasn’t worked for the faith healer for a couple of years, only to make a call as soon as Dean and Cas drive away. Meanwhile, Sam has gone to wait at the motel where Claire was staying. When she asks him how he found her, he shows her the postcard from the hotel and then gives her a “pro tip” – use an alias! He then proceeds to show her how to hack credit cards to track her mother’s movements and says he’ll help her set up some fake credit cards of her own. I really liked that this scene continued a theme started when Sam confessed to Charlie that, despite his reluctance when Dean first came to find him all those years ago, he loves the hunting life. His enthusiasm when showing Claire some of the tricks of the trade showed a lighter side to Sam than we have perhaps ever seen when referring to hunting. The scene also brought up the subject of Mary and gave us one of my favourite lines of the episode, when Sam said about his mother, who died when he was six months old, “I got to know her later in life”. He is so matter of fact about it and does not even realize it sounds strange until he sees the look that Claire is giving him. When Dean and Cas return with the name of the faith healer, and a Grumpy Cat toy that Cas bought Claire for her birthday, Sam starts trying to track him down. Before he can do so, he gets a news alert that Ronnie has been found dead in the alley outside of the bar where they interrogated him. With Sam staying behind to try to get more information, Dean, Cas and Claire head out to the alley. Despite having to explain Claire’s presence by saying it is FBI “bring your daughter to work day”, they are able to look at the body and see that whatever killed Ronnie made a very similar wound to one made by an angel blade, but with different marks around the edges. When the three of them return to the motel, Sam has found a lead on Holloway, the healer. Sam and Cas are adamant that Dean stay behind while they go check out the place he may be holding Amelia, worried about Dean’s recent behavior and not wanting to expose him to a situation that might make him give in to the Mark. After trying to argue his case, Dean reluctantly agrees to “babysit” Claire. While they are driving to hunt the healer, Cas asks Sam about Claire and in a mirror to the answers his brother gave, Sam tells Cas that he is doing the right thing by trying to be around for her as she is only 18. When Cas says that Sam went out on his own at that age to go to college, Sam points out that his circumstances were a little different and suggests that Cas should be there for her even if she doesn’t seem to want him to be. Sam says that in the end it will turn out to be the right thing to do, perhaps thinking of his own efforts to save his reluctant brother. In the meantime Dean and Claire, to stave off boredom, are playing mini golf. Probably not the usual golf game Jensen Ackles and Kathryn Newton, both avid golfers, play, but I’m sure it was still a lot of fun for them. 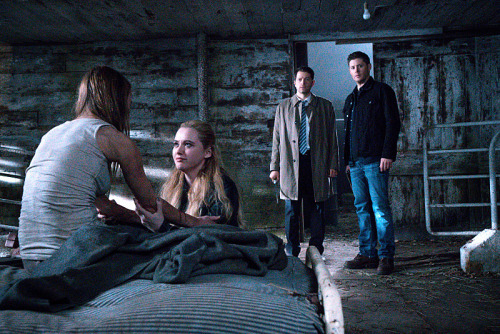 This was one of my favourite scenes in the episode and Jensen Ackles and Kathryn Newton play off each other perfectly. Dean is always a little gentler when he is around kids, even if Claire doesn’t think of herself as a kid, and his Caddyshack reaction and her subsequent Happy Gilmore reference were a perfect example of that. Whether it is just in his nature or whether it is from the years he spent looking after Sam when they were younger, he always seems to know what the children around him need to hear. Claire still has a lot of anger about the fact that her father left her and was killed because he allowed Cas to use him as his vessel. In my opinion, Dean knew that she needed to hear something more than that his choices helped Sam take down Lucifer. When he tells her that Jimmy’s sacrifice led to Cas being able to save the world, you can see that Claire looks a little lighter and hopefully can start to move on with her life and perhaps even become a little more comfortable with Cas. When Claire drops her putter into the last hole, Dean realizes that maybe the marks around the wound were from an angel sword rather than an angel blade. Claire is impressed that he could get that from a putter, but a little less impressed with the research side of hunting! They discover that the faith healer they have been looking for is in fact an angel from a very old (thought to be extinct) sect that has been on earth for thousands of years – the Grigori, or watcher angels – some of which help people and some of which prey on people. When Sam and Cas reach the farmhouse owned by Holloway, Sam is attacked in the house while Cas finds Amelia in the barn. At first she doesn’t realize that she is safe but when she wakes up fully, she is horrified to find that she has been dreaming the whole time. Although obviously upset when she realizes Jimmy is no longer in his vessel, she rallies when Cas tells her that Claire is safe. Sam, meanwhile, is handcuffed to a chair by Holloway, or Tamiel (Treva Etienne) who explains that he has been feeding on the souls of the people that he has been holding. When neither Cas or Sam answers Dean’s call, he decides that he has to go find them. After giving Claire a gun, and asking her not to shoot him, they leave together to track them down. On arriving at the barn, Claire finally gets to be reunited with her mother. 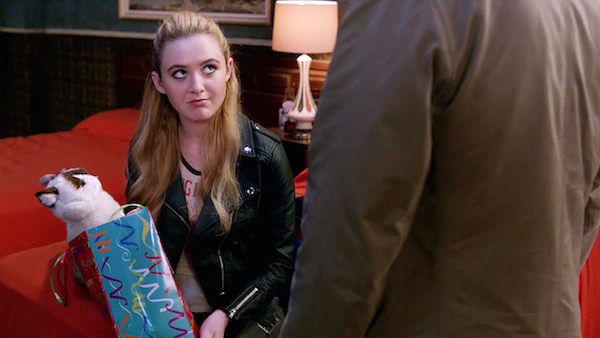 I thought that Kathryn Newton played Claire’s reaction perfectly here. Her whole reason for finding her mother was to give her a piece of her mind for leaving, but as soon as she saw her, the love for her mother overcame everything. Unfortunately their meeting was to be short and not particularly sweet with Amelia coming to her daughter’s rescue by putting herself between Claire and Tamiel’s angel sword. If I am honest, I was a little upset that the story went in that direction. Claire has had so much sadness in her life, I was hoping that she and Amelia might get to go back to having a relatively normal life, but maybe the show has more plans for Claire that required the story to go there. Following Amelia’s death, a very impressive fight scene breaks out with Dean, Sam and Cas all taking on Tamiel. It finally is Claire who kills him with the angel sword, right as he is about to strike down Castiel. Claire then returns to her mother’s body and her sobbing “I’m sorry” is just heartbreaking. In a reversal of the initial scene of the episode, we now see Amelia walking through the door and Jimmy running down the stairs of their house. It is a bittersweet moment for Jimmy – he has been waiting for Amelia for so long, and yet he knows if she is in heaven with him, then Claire is alone in the world. I do have a slight issue with how Amelia got to heaven when it is still closed and souls are going to the veil. I am wondering if the fact that Jimmy and Amelia are sharing a heaven and are therefore, based on previous explanations, soul-mates, made a difference and allowed her to get to heaven. There are still many questions about the current state of heaven and the angels that have gone unresolved. Back on Earth, Sam has given Claire Jody Mill’s number and says that she will give her a place to crash while she gets herself sorted out. With all the young wayward people that Sam and Dean are sending her, I think the sheriff will have to think about getting a bigger house! I do think a spin-off featuring Jody and her wayward teens, maybe with a little Sheriff Donna thrown in, would be a lot of fun. As they say goodbye, Dean gives Claire a copy of Caddyshack and a research book on Enochian Myth to make up for taking the gun back. When she pretends that she isn’t interested in the research, he lets her know that he saw her take the sword, but he doesn’t take it away from her. He does try to talk her out of following in their footsteps into hunting by telling her that it is too dangerous and would lead to a short life, to which she responds ,”I don’t know, you seem pretty old”! When she asks if he will be OK, Dean is surprisingly honest when he says that he doesn’t know but that he will keep fighting; a nice reference to Jared and Jensen’s Always Keep Fighting charity campaign. When Cas goes to tell Claire, in his socially inept way, that if she needs anything to call, she hugs him – something that I think they both needed. Sam reassures a visibly upset Cas that Claire will be OK as she leaves in a cab. 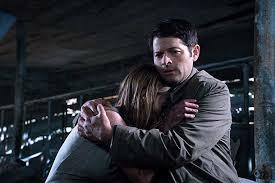 Whilst Jimmy might be in heaven and Cas is no relation to Claire, I definitely felt like Cas was losing a daughter here. Cas has never had family before in the way that Sam and Dean have, and bringing Claire back was a novel way to open up new aspects to Cas’ character. All in all, I enjoyed this episode despite the couple of little questions that I had regarding access to heaven. Next week the Book of the Damned raises its head again and I can’t wait. As always, we would love to hear your comments.